The gemstone that is transparent, of fine and good colour, soft in touch and gives luster and radiance, is considered a stone of good quality and auspicious gomedha. The gemstone having a light blackish hue, without radiance, rough, flat, full of layers and which looks like a yellow piece of glass, is a stone of average quality and is not considered auspicious. Wearing of an unblemished Gomedha ensures the native safety and protection from deadliest of enemies. Gomedha bestows health, wealth and prosperity to its owner. A blemished gemstone is harmful for the wearer. 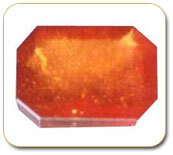 The red coloured gomedha is injurious to health and one having a mixture of mica is destroyer of wealth. Who Should Wear Gomedha ? Rahu and Ketu are shadowy nodes and do not own any signs in the zodiac. Rahu and ketu give the results of the lords of the bhavas or houses they occupy. Therefore, if Rahu and Ketu occupy a bhava (house), the lord of which is an auspicious planet in a birth chart and is well placed in it, Rahu and Ketu will give better results of that particular planet. In such circumstances it will be beneficial for the native to wear a Gomedha for Rahu or Cat's eye for Ketu in their major and sub-periods.